The federal reserve bank recently decided to raise interest rates for the fourth time since the recession bringing the federal funds target range to 1-1.25 percent. The fed also revealed their plans for balance sheet normalization. The only dissenter to the fed decision was Neel Kashkari who voted to keep interest rates unchanged. This week I want to discuss the details of balance sheet normalization as well as some of the criticisms that Neel Kashkari raised. 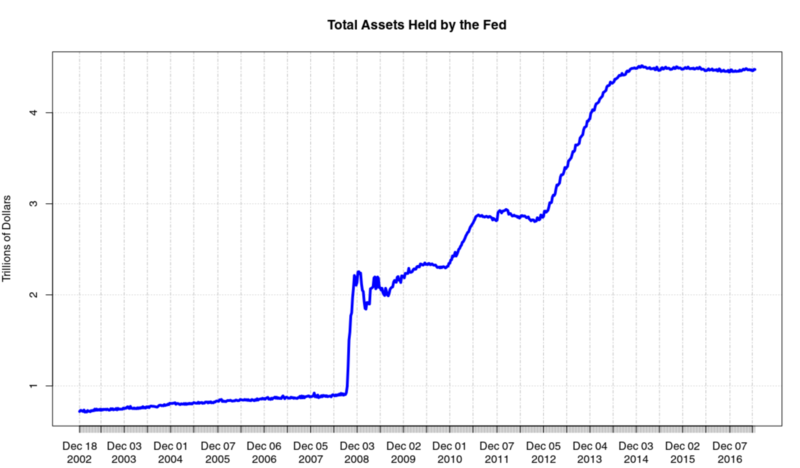 Before we discuss balance sheet normalization let’s discuss the current and historical state of the fed balance sheet. Figure 1 shows all assets held by the fed, you can clearly see that the balance sheet became an important tool of the fed following the housing crisis in 2008/2009. In the years following the crisis, the fed would buy treasuries and mortgage backed securities through a process known as quantitative easing. Through quantitative easing, bank balance sheets remain little changed, because they receive reserves from the fed in exchange for their treasuries and mortgage backed securities. Assets on the fed’s balance sheet on the other hand are expanded by the number of securities they received from the banks and are offset by an equal increase in reserves. The question on many people’s mind since quantitative easing began was how the fed would unwind the balance sheet, with many saying it would not be possible because it would disrupt the market. In the most recent press conference, Janet Yellen explained the details of balance sheet normalization. The fed will begin reducing its balance sheet by selling $6 billion of treasuries and $4 billion of mortgage backed securities per month; over time this will gradually increase to a maximum of $30 billion worth of treasuries and $20 billion worth of mortgage backed securities each month. It is important to note that the maximum selling pace will be less than the maximum purchasing pace under quantitative easing. Raising interest rates and reducing the fed’s balance sheet are both being used as tools to slow down the economy. However, the main question is, “Why is the fed eager to slow the economy and are they making the right decision.” The fed’s mandate is to maximize employment, stabilize prices, and moderate long-term interest rates. In other words, the fed must believe that prices are rising too fast. However, inflation is still below their target of 2%. Yellen stated that she believes that inflation is currently being held down by transitory factors, namely lower cell phone plans and lower pharmaceutical prices. I would like to go on record and say that pretty much nobody in American agrees with this assesment of pharmaceutical prices and phone plans. I would also like to point out that the fed has been blaming transitory factors for low inflation for nearly a decade now. Not everyone at the fed agreed with this decision, Neel Kashkari the lone dissenter thinks that it would be best to wait and see. Before becoming the chair of the Minneapolis fed, Kashkari was best known as the $700 billion man because of his central role in the Troubled Asset Relief Program (TARP). Kashkari had been a Goldman Sachs banker before he worked at the treasury. After he left the treasury he moved to a cabin in the California woods and chopped wood for a few years before returning to finance with a job at PIMCO. At PIMCO he spearheaded the bond company’s foray into equity investing, all six of his funds underperformed the benchmark and he left again because he had a desire for public service. He then ran for governor of California and lost. Then he was chosen to head the Minneapolis fed. The reason I am giving this background on Kashkari is because I suspect that he will likely play a bigger role at the fed in the future and that he is someone who Trump would probably consider as a replacement for Janet Yellen. Kashkari explained his dissent in a post on the Minneapolis fed’s website. In his post, he pointed out that while the unemployment rate has been falling, inflation has also fallen and remains low. He is not convinced that this is transitory and he believes that there is no reason to rush into tightening. In his post, he speculates on the perhaps, misplaced faith in the Phillips curve. The main conclusion of the Phillips curve is that as unemployement falls wages will rise, firms will raise prices to pay those wages and therefore prices/inflation will rise. I would tend to agree with Kashkari in his distrust of the Phillips curve and agree that we should focus on the actual data, but I think Kashkari also has an ulterior motive. By remaining the most dovish member of the fed, it would make him the most likely replacement as chair in the event that the fed is raising rates too soon. If there is an economic downturn, Trump will almost certainly blame the fed and accuse them of being political.